There’s nothing better than heading to work on my Friday with a car packed full of adventure. Knowing I’m going to start my travels as soon as I clock out is the best way to start a weekend, believe me. 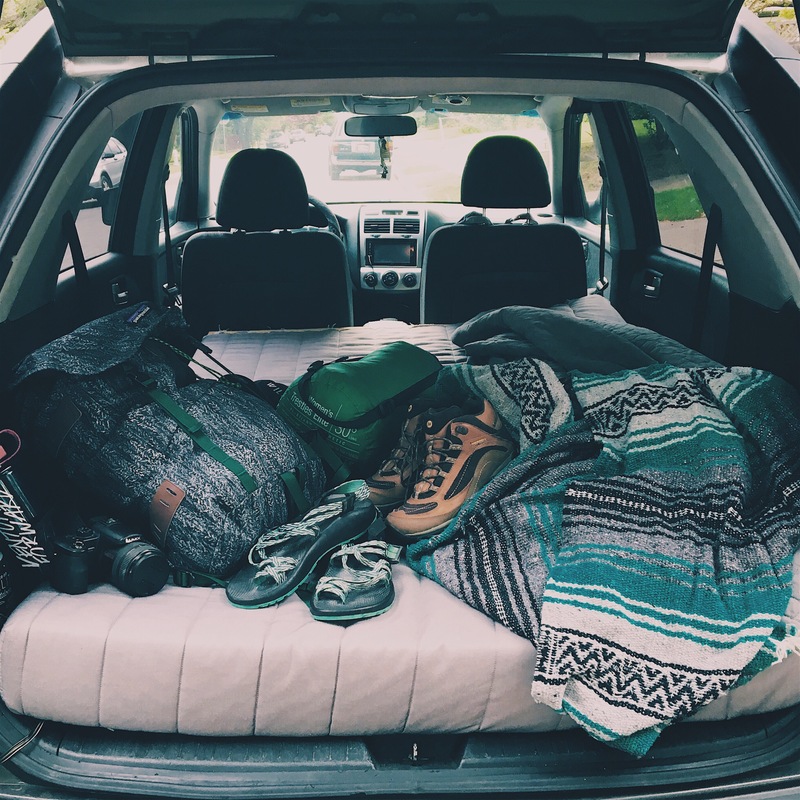 Driving, sleeping, adventuring – this car is ready! While planning this roadtrip with my dad, he kept talking about Four Corners for weeks in advance. More familiar with a brewery by the same name, I had no idea what he was talking about but knew to plan it into the trip. 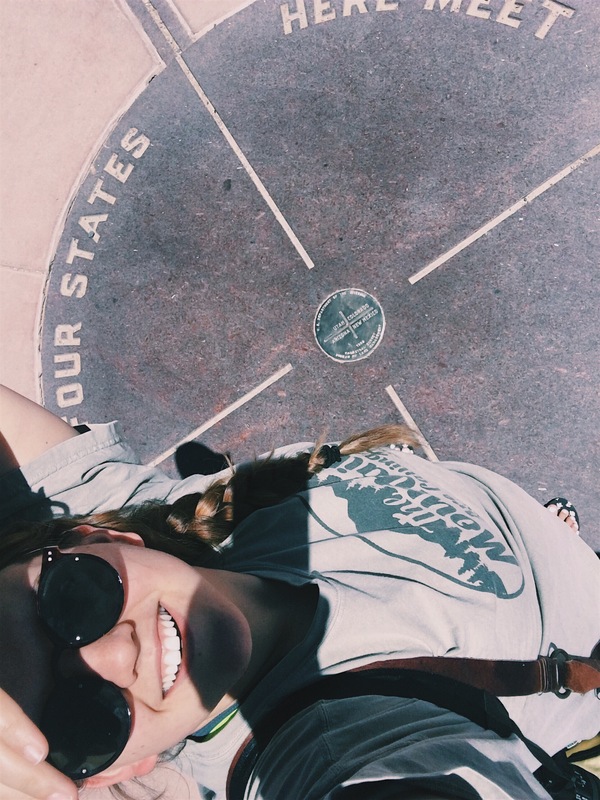 The Four Corners Monument is the point where Utah, Colorado, New Mexico, and Arizona meet. This means that if you stand in the middle of this intersection…you’re actually in four places (states) at once! Such a cool idea to me because I’m constantly worried about spending my time wisely and wishing there was more of me to go around. Ah, look at me doing so much with this life. After checking out the local Navajo craft booths we settled back into the car. Heading into Colorado, we made our way to Mesa Verde National Park. 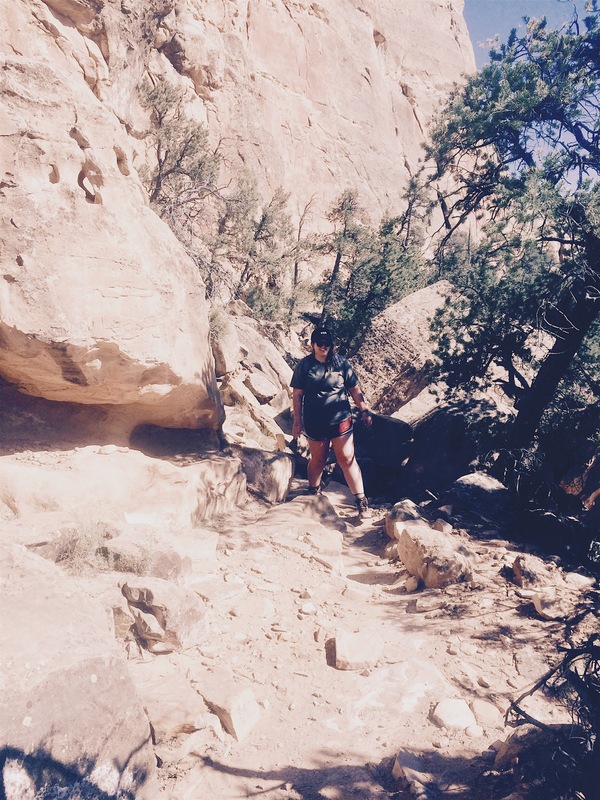 I got my stamp for my National Park passport and we explored some of the ancient cliff dwellings. Our main purpose here was to hike the majority of the park and try our hand at working with the varying levels of elevation. We took the Spruce Canyon trail which included a lot of informational highlights, including some old petroglyphs from the Pueblo peoples. It was hot and a little trickier than expected trying to navigate steep footholds and hidden cliffs, but well worth the effort by the end. I actually managed to lead a nearby couple who couldn’t figure out one of the rock steps to continue on the path. The zigzagging ascent to about 7000 feet was such an accomplishment though! My first “mountain” had been hiked. All the closeups include me looking ROUGH! After sweatily checking out the gift shop amidst happy families, we then trudged back to the car. We were tired and ready for a hearty meal, a shower, and a long sleep. That resulted in stopping for American fare in Mancos, CO and checking into our Airbnb. 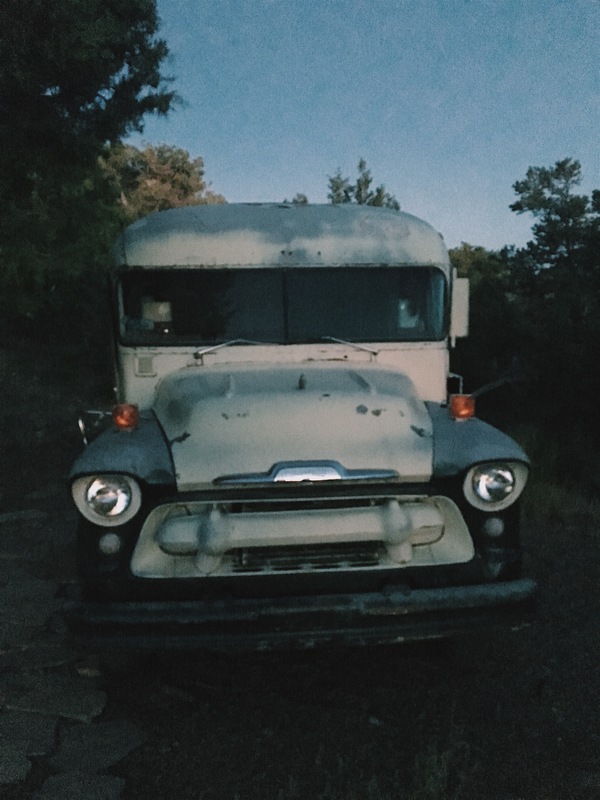 Now, I don’t know if you’ve read Into the Wild but it tells the tale of a kid who left it all behind to live off the land in Alaska when he finds a bus to make into his shelter. So part of the allure of Mancos was getting to stay in this converted Volkswagen bus! I­t­ had a full bed and kitchenette inside. (I was so tired I didn’t take any pictures – what a dummy!) As a side note, I one hundred percent recommend anything written by Jon Krakauer. From one automobile to the next! There was a cute fire pit nearby for cooking also. They had a shower in the nearby artist garage as well as a compost toilet! I thought everything was so cool and interesting. Let’s just say my dad took a bit longer to come around. Even though we’d spent a tiring day driving many hundreds of miles, it didn’t bother me that bedtime involved retiring to a bus. I always said I wanted to try everything!